Summer Arrives with Tasty Eats! June is packed with reasons to celebrate: the first day of summer arrives in June; baseball is in full swing (pun intended); and June hosts National Fresh Fruit and Vegetable Month, Turkey Lover's Month, and Men's Health Month. This will be fun! But I want to turn first to this month's highlighted food: cabbage. While it appears I am sticking to the "green" theme from the previous months, cabbage has other color variations. Find red/purple cabbage as well as Chinese cabbages like napa cabbage or bok choy with green, yellow, and white colors in the heads. Buy: Look for heads of cabbage that are tight, compact, and firm without obvious decay. In leafier cabbages like napa and bok choy, look for firm leaves that are still tightly compact. Cabbages will feel heavy for their size. Price: According to the U.S. Department of Agriculture, cabbage is priced $0.62 per pound on average. When a 2-1/2 pound cabbage yields 9 cups of raw shredded cabbage (or 7 cups once cooked), you can feed 9 people for $0.17 each! Affordable, no! Store: Keep cabbages in a cool and moist environment like a refrigerator. Cabbages will store well for a while, but nutrients will be lost over time, so use as quickly as you can. Prepare: From cabbage heads, peel away and discard a few of the outer leaves. Cut cabbages in half and, from each half, cut out the core. Then, cut or shred into the size pieces you want. 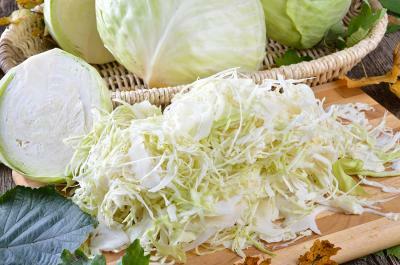 Eat: Cabbage can be eaten raw or cooked. Cabbage from the top end or end furthest away from the core will be more tender and is ideal for eating raw. Cabbage pieces closest to the core are less tender and better cooked. Note: The strong odor of cabbage comes from sulfur compounds in the cabbage. Long cooking releases the sulfur causing the smell. To limit the odor, eat raw or cook for a short amount of time. Now, summer seems to be the classic season for grilling, BBQ, and watching baseball. To get in all those June celebrations I mentioned earlier at once, try the Pulled Turkey BBQ with Coleslaw recipe below. This sandwich is a great pairing with the start of summer. Cabbage in the coleslaw is the fresh vegetable to celebrate National Fresh Fruit and Vegetable Month (check out an area farmer's market to find cabbage). Turkey in the BBQ celebrates Turkey Lover's Month. And men's health will benefit from this recipe. Compounds in cabbage may reduce the risk of some cancers, including colorectal cancer common in men. As well, turkey is a lower fat option than traditional pork BBQ, and diets low in fat may reduce risk of heart disease and some cancers. Similarly, diets high in whole grains, like those found in the whole wheat buns, may help reduce the risk of heart disease and some cancers. Try this recipe at your next ballpark party! If you cannot find turkey thighs, use breast meat or look for chicken thighs or breast meat. 1. Place turkey thighs and BBQ Recipe (or prepared BBQ sauce) in 3-4 quart slow cooker. 2. Cover and cook on high 1 hour and reduce to low. Cook another 5-6 hours on low or until cooked. 3. Shred turkey and return to slow cooker until ready to eat. 4. Fill each sandwich bun with turkey and about 1/3 cup slaw. 1. In a small saucepan, combine all ingredients. 2. Heat to boiling and reduce heat. 3. Simmer 5 minutes or until thickened, stirring occasionally. 1. In a medium bowl, whisk together mustard, vinegar, oil, and sugar. 2. Add onion, pepper, and cabbage and toss. WEB HIGHLIGHT 1: Check out more information on cabbages through the University of Illinois Extension. Besides information on nutrition and preparation, learn to grow your own! WEB HIGHLIGHT 2: To see how many fruits and vegetables you need each day, check out the Fruits and Vegetables sections of Choose MyPlate. WEB HIGHLIGHT 3: Guys, test out your health knowledge with this 10-question quiz from the Agency for Healthcare Research and Quality. FOOD SCIENCE HIGHLIGHT: Anthocyanin: Anthocyanin is a pigment found in red cabbage that gives the cabbage its distinct red/purple color.